Posts tagged " vouching "
In life, it always helps to have someone vouching for you—even better if they have the clout to back it up. The same is true when it comes to marketing CPG products and services. To make your voice heard and your products or services seen, you need a way to make your business’s signal stand out amongst the noise, especially online. We’ve heard the statistics about what makes PR an invaluable tool: editorial media placements drive 3x more purchases than advertising alone. A blog mention takes that number up to 9x. Consider that the average coupon has a 1 percent redemption rate. That would mean a media placement has a 3 percent conversion rate and a blog 9 percent. A positive post from just one well-known, reputable blogger can meet sales goals. While you could just wait for someone to blog about your product eventually, jumping ahead of the game with a brand ambassador program can bring about results much more quickly and efficiently. We manage multiple blog ambassador programs for our clients, including Dryel and Robern. 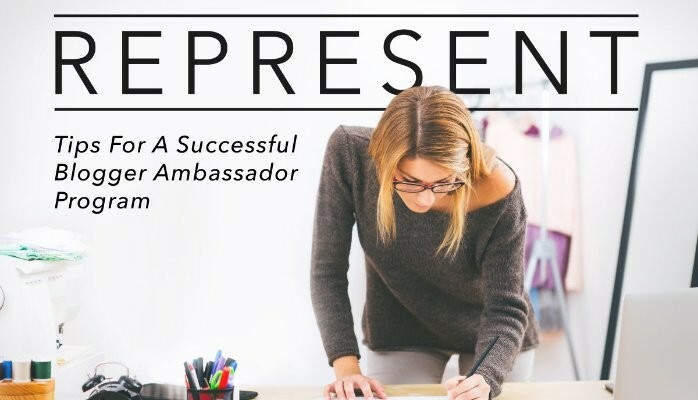 Here are some tips we’ve found effective in launching and maintaining a blogger ambassador programs. It’s important for any business strategy, and it’s certainly important here. Do you hope to achieve brand awareness, enhanced image or perhaps increased content for social media? By narrowing your focus, you’ll find it much easier to decide who you’d like to represent your brand and what you’d like them to say. 2. Target ambassadors based on goals. Positive buzz is good no matter where it comes from. To make your brand ambassador program worth the time investment, however, you should target individuals who best fit your goals. For example, if your product is furniture, and you would like to create brand awareness among first-time homeowners, you should target bloggers who fit that demographic, or even better: if they already have a sizeable following in that demographic. 3. Engage through social media. 4. Make them come to you. There’s a difference between targeting potential ambassadors and directly recruiting them. Sure, you could simply reach out to an individual and ask them to blog about your brand. But if you want to foster organic and enthusiastic word-of-keyboard, you should allow ambassadorship to evolve naturally from regular engagement. 5. Keep your ambassadors talking. You’ve established relationships with a decent number of bloggers, gotten them talking, and you’re starting to see results. Now what? Keep up the momentum. Give your ambassadors a reason to stay ambassadors. Don’t stop engaging them once you have them on the hook. Make sure they’re up to date on any new business developments. Incentivize them with early access to new products and exclusive opportunities like facilities tours and interviews. In the end, a blog ambassador program is as simple as engaging the people you want to engage, something essential to marketing and customer service in general. When utilized effectively, however, they can be an extremely powerful tool for building your brand.